This work belongs to a collection of personal paintings of Retamero Sánchez. 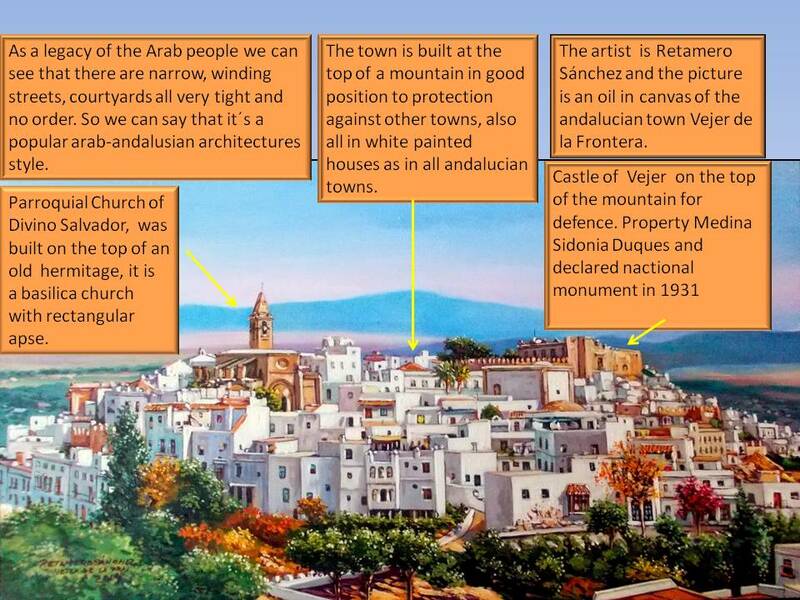 It is a painting of a small town in the province of Cadiz, South of Spain, called Vejer de la Frontera, wich is near other towns like Conil de la Frontera, Zahara de Los Atunes and Chiclana de la Frontera. The painting was taken from the website retart.es and it was made 2014. 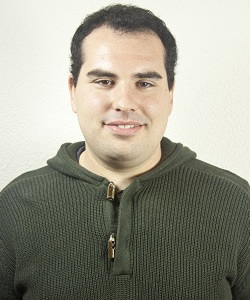 Retamero Sánchez is a Spanish painter born in Jerez de la Frontera (Cádiz). He is a self-taught painter with over thirty years of experience, classified as impressionist figurative although his trends are constantly evolving, but always staying true to a personal style. We can appreciate that the author has used the style of oil painting, as he does in most of his paintings. 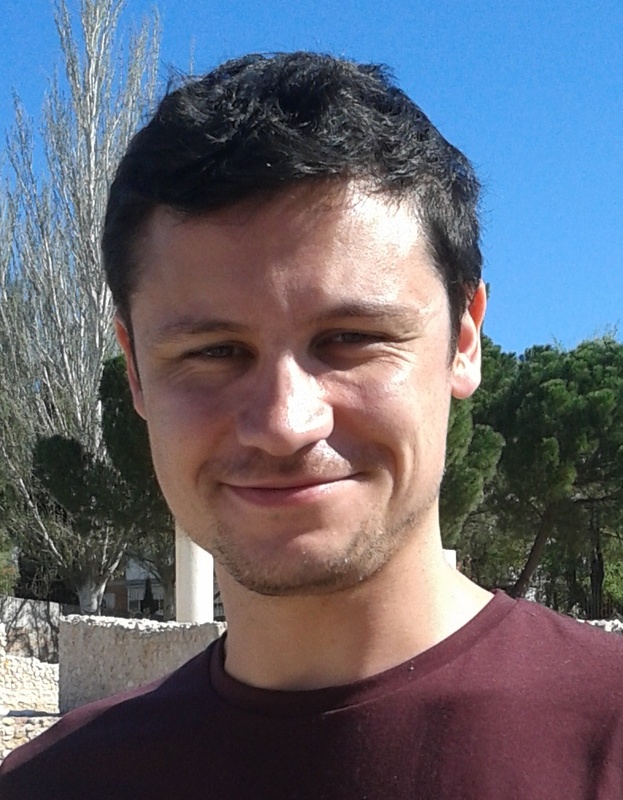 He wants to show us how a typical Andalousian town looks like, the magic of a town with all the houses painted in white and how the sun shines in its making. As we can see, the town is at the top of a mountain so we can distinguish the rich flora with beautiful coloured plants and trees. Vejer de la Frontera was conquered by the Arabs in 711 and was under their rule for five and a half centuries. The Arabs imposed their religion, customs and buildings and gave to this town a very peculiar appearance. All the buildings are painted in white as in every Andalusian village to soak the heat and not to be so warm indoors. We can see that Vejer is located at the top of a mountain in order to be very well defended. As a legacy of the Arab people we can see that there are narrow, winding streets, courtyards all very tight and no order, so we can say that is a style of popular Arab-Andalusian architecture. Also, we can find like in most of the Arab style towns, that the central area is the most important one. In the past there were a mosque and a palace but now there are a parish church and a castle. The Castle of Vejer was declared a National Monument in 1931, and the parish church of Divino Salvador is the second tallest building. We can also see the Torre de Buenavista and the Torre de la Corredera. Finally, there are a number of gates to get into the city, and some principal streets to facilitate communication between the center and the outskirts. Nowadays the Vejer has two different parts, the one on the top of the mountain and the one at the one by the beach. As economic activities today predominates tourism, trade and fishing. This painting is a work by Carlos Galvao, a Portuguese artist who is an expert in oil and acrylics on canvas. This painting was done in 2014, and it is downloadedfrom the artist’s website. 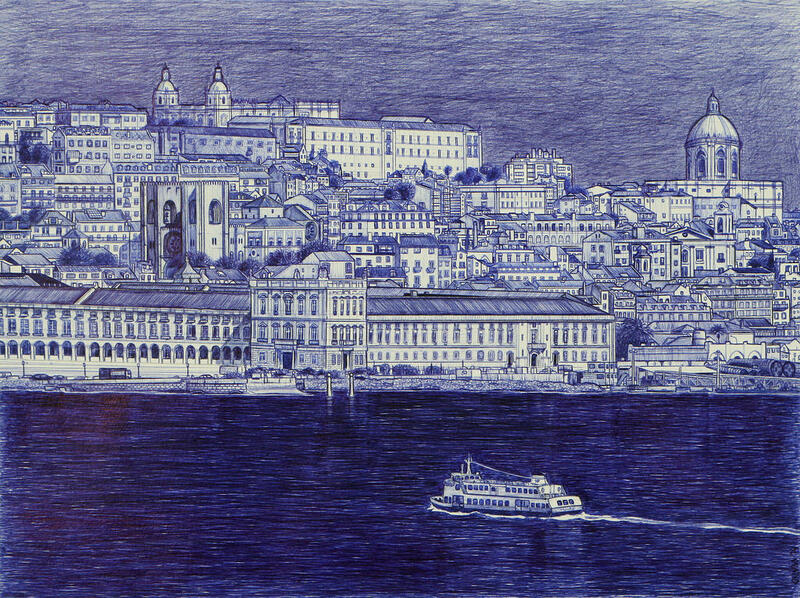 It portrays with great details an aerial view of the city of Lisbon. It shows one of the banks of the river Tajo, where we can see the famous Market Square, known for being the most important square of Lisbon. Lisbon is the largest city and the capital of Portugal. It is located at the mouth of the Tajo River. The city has a population of 547,773 habitants and is the richest of the country. It is located in West Portugal, facing the Atlantic Ocean, and is one of the warmest European capitals. The spring and summer are usually sunny with highs around 28°C during July and August and minimum of about 16°C in Autumn. Thw winters are typically rainy and windy, with some sunny days. The climate of Lisbon is strongly influenced by the Gulf Stream so the temperatures are milder with abundant rainfall. The place represented in the painting has always been the best entrance to Lisbon. Many kings and important people arrived there by boat, got down from their ships and went in the city by the marble stairs that we can still see in the square rim. 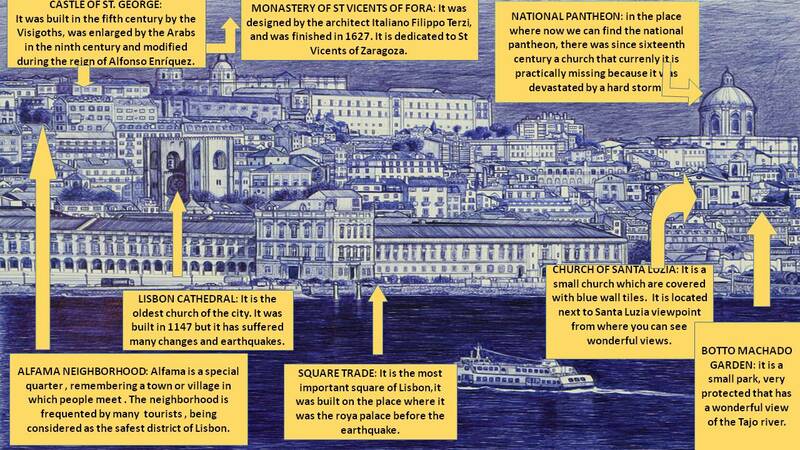 Another thing that I consider important is the earthquake that Lisbon suffered in 1775 and claimed the lives of between 60,000 and 100,000 people. The city was almost completely destroyed and many buildings were reconstructed, including the Market Square. We can appreciate in the painting a boat as a way of transportation and crossing the river but there are also two bridges: the Bridge of April 25, and the bridge Vasco de Gama. For the inside Lisbon has five tram lines, four of which have antique look so they attract many tourists. We can also highlight several religious buildings such as the church of Santa Luzia, the monastery of St Vincent de Fora and Lisbon Cathedral, all of them with great importance. Finally, on the right of the picture, we can see the most impressive building in this drawing, the National Pantheon, also known as the Church of Santa Engracia. Since the early 20th century, this building served as a burial place for famous and important people from Portugal. The most remarkable fact is the architecture of the Pantheon is its large white dome, which stands majestically between the roofs of Alfama and can be seen from some of the viewpoints of the district, as the Mirador de Santa Lucía. This work of art belongs to an atlas called Civitates Orbis Terrarum, by Georg Braun and Franz Hogenberg. This atlas contains more than 500 maps of cities of the world. This woodcut represents the city of Tenochtitlán, which is the capital of the Aztec Empire (nowadays Mexico City). It was made by the cartographer Antoine du Pinet (1564) but thanks to the help of the engraver Francesco Valesio, who illustrated the work of A. Pinet. The image is based on a map included in a letter by Hernán Cortés that was written in 1524. We might say that Mexico-Tenochtitlán was located in the Cuenca of Mexico, between the 2,270 and 2,750 meters on the sea level, in the southern part of the Mexican Plateau. The foundation of Tenochtitlán is not very clear because myth and reality mix up but it is dated more or less in 1325. The word Tenochtitlán is the leeway of the words tetl (stone) and nochtli (prickly pear); the stone where the tunal is placed means “Heart of the Earth”, for the form in which it is represented. The city was originated in an islet of the Texcoco Lake. Texcoco was part of a system of lakes, at present in disappearance process, located to the south-west of the Valley of Mexico. During the Aztec Empire, they constructed artificial islands in the shallows of the lagoon, with the intention of building up towns. 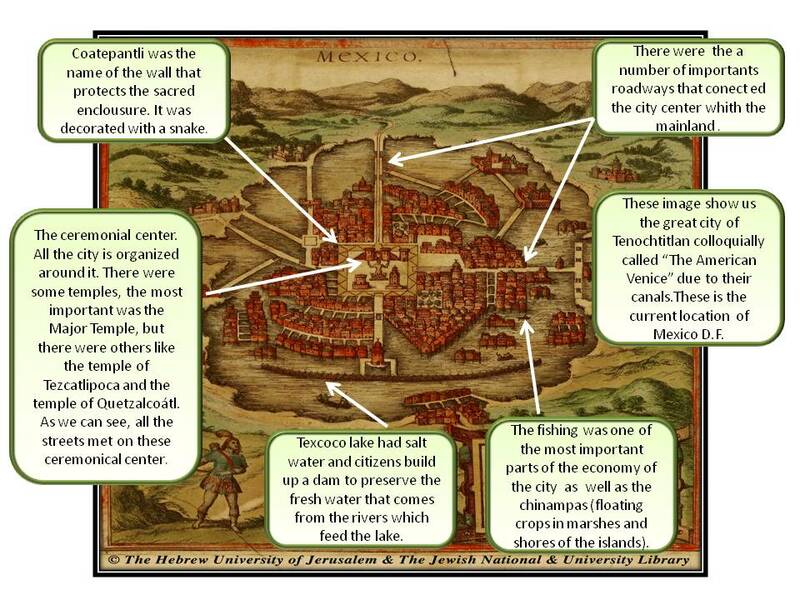 These islands were extended artificially up to including Tenochtitlán itself and the twin city of Tlatelolco. Tenochtitlán was not located in the center of the Lake Texcoco, but in a sort of bay in the South-Western angle of the same one. It is curious to note that although the lake of Texcoco was salted, the city was surrounded with fresh water thanks to the dykes constructed by the Mexicas that allowed to concentrate the river water that fed the lake. The city disappeared when the Spanish conquest, after a siege organized by Hernán Cortés in 1521, and then it was constructed the new Mexico City. The image clearly shows us a great example of radio-centric town planning with the axis in the ceremonial center of the sacred enclosure. 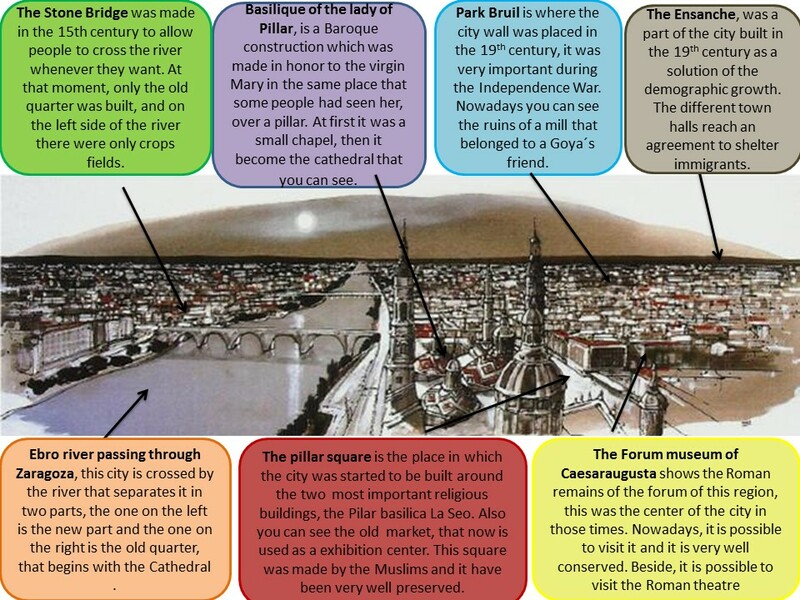 From that point onwards, the metropolis was expanded following a concentric form according to how the different social classes were related to that religious center. In the surrounding areas of the sacred enclosure the housings of the noblemen were getting up, also the managers and craftsmen and, in the periphery, a rural population. The city was plenty of small canals that acted as real streets and this is why it was called “the American Venice”. Another curious thing was that the “symmetry” of the city was maintained by means of an official called calmimilócatl, which had to supervise any construction and prevent from being invaded the streets and channels, which were constructed previously. It is known that in the ceremonial center there were 78 buildings, of which, today it is known the Great Temple and some buildings more that sublie under the current Cathedral. The whole ceremonial center was surrounded by a wall called coatepantli, which was decorated with figures of snakes and was measuring approximately 2,5 meters high. The Great Temple was the biggest building inside the sacred enclosure. At the top of the Temple, there were also two ritual templetes for the sacrifices: one dedicated to Tláloc and other to God of the Sun. This sacred enclosure was placed in the center of Tenochtitlán and as we can see and was connected with all the parts of the city by four main strees. In addition, there were three main roadways that connected the city center with the outskirts. In relation to the ecomical activities, the basin of Mexico offered a large amount of natural resources. The Aztecs supplied the city by means of an intensive farming with cropfiels and chinanpas (floating cultivation in marshes and shores of the islets). The most important cultivations were based on corn vegetables and flowers. They also fish a great variety of species (fish, birds, axolotles, frogs, freshwater shrimps) and hunted terrestrial fauna (rabbits, deer). The instruments to work these grounds were simple: they only used the coa (stick used for the farming) that was expanding in hoe. The commerce was in charge of the pochetcas (businessmen) that, in spite of its high social level, were not remaining exempt from paying tax. Generally, the commerce was done by exchanging goods, equivalents in value, or by means of currency, which was represented by grains of cocoa or beans. This class of commerce, favored the product exchange, and therefore Tenochtitlán developed as a very important market city. This image is a not drawn to scale perspective map of Santo Domingo city. It was made in 1671 by John Ogilby, a Scottish cartographer and translator who lived in London during the 17th century. The map was included in Ogilby’s work called America: Being the Latest, and Most Accurate Description of the New World, which was an expanded and hand coloured translation based on a book published in Amsterdam by Arnoldus Montanus. This draw is an antique map part of a group of volumes characteristic of sixteenth and seventeenth centuries where text, maps and illustrations about the European colorizations were joined. This bird’s eye view shows the first European city founded in the New World in the 15th century on the southeastern coast of the island of Hispaniola, on the Caribbean Sea. As it appears in the map, the proximity to the sea and the river facilitated the protection of the city. While the sharp cliffs created a natural defence, the river meant the water supply and thus the existence of crops and other tropical plantations that can be appreciated in the bottom right part of the image. Furthermore the river mouth provided a natural sheltered port. This city was firstly founded by Bartholomew Columbus in 1496 on the right bank of the Ozama River and then, after being destroyed by a hurricane, it moved to its current location on the left bank in 1502. The first building, which construction was initiated by the Governor Nicolás de Ovando to protect the city against corsairs and pirates, was the Ozama fortress. From then, the whole city was edified surrounded by a fortified perimeter with city walls, towers and a moat that provides it with the appearance of a defensive city as the map depicts. Concerning the town planning, Santo Domingo was built up during the first half of the 16th century following an orthogonal plan with a well-structured street layout and many parks and green areas, serving as an essential point of reference for the construction of the Colonial grid cities. 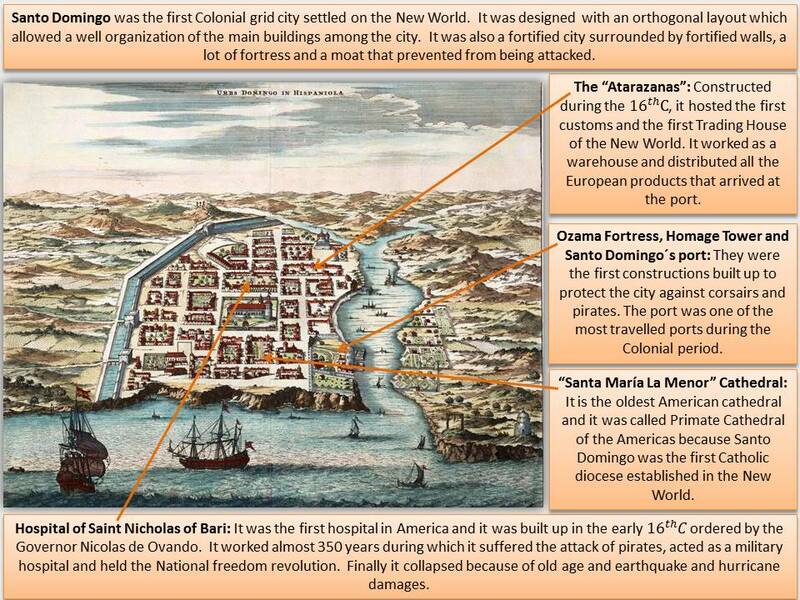 On the left margin, the map highlights the defence wall with the main entrances that lead into the principal roads such as the Royal Coast Road which connected Santo Domingo with San Iago and Azua. In addition, on the background, the “Casa Consistorial” or the “Cabildo” stands out from the rest of the constructions because of its size, so it could mean that it had an important function on the city life as it was the town council. During colonial times and even now, Ozama’s port has been really important for the city’s economic development, becoming the centre of economic activities in the Dominican Republic. Besides, the trading activity had made this port the busiest port in the country over time. 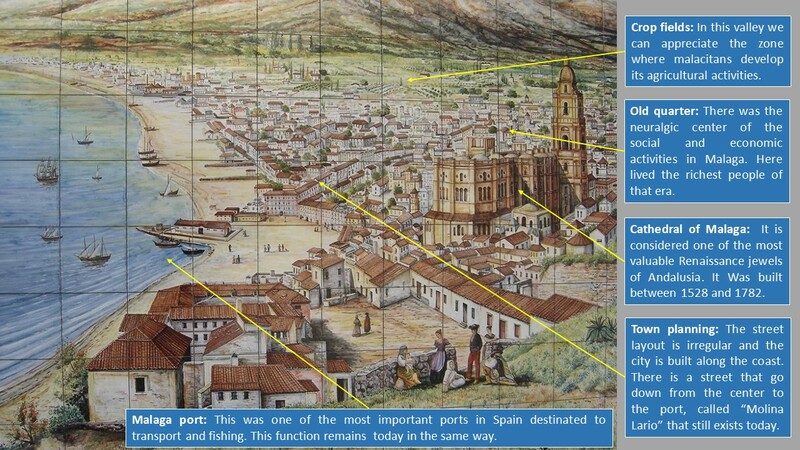 The port facilitated trades, and it was the point from where many colonization expeditions headed by famous explorers such as Ponce de León, Vasco Núñez de Balboa or Hernán Cortés were launched. 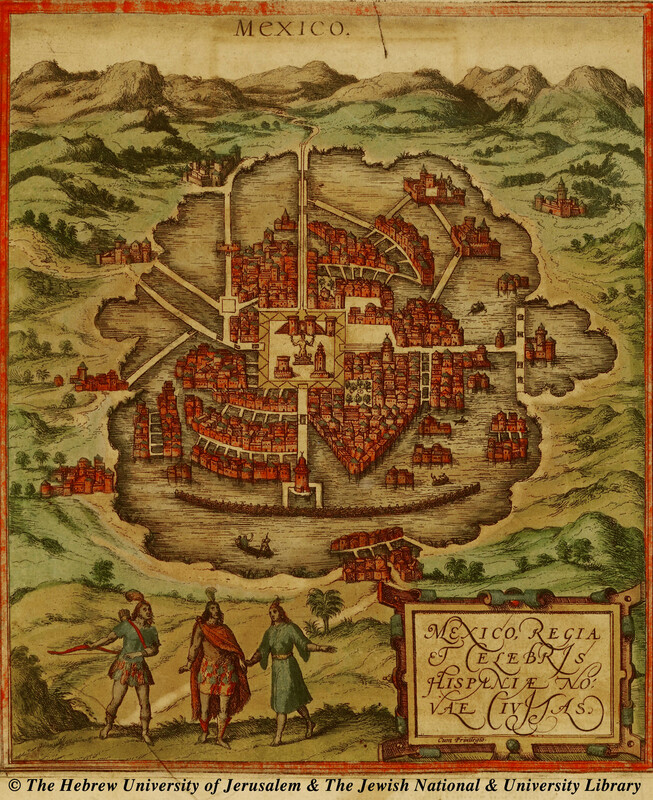 The city was favoured and enriched because of both foreign and internal trade and so many explorers owned a house, as Hernán Cortés’ house that appears in the map, and created jobs for the indigenous people that still inhabited the region. It is important to mention, that the good location of the city and the port facilities not only provided satisfactions since it led into frequent assaults, loots and pillages. The most known attack was carried by an English corsair called Francis Drake who devastated and destroyed the city for ransom. Despite this, Santo Domingo has been always a trade city in which cultural, economic and religious activities took place. Anton Van den Wyngaerde is the author of this image. He was considered the most famous topographer in the Rennaissance, because his most important aim was the cartographic precision of the landscape representation. During the sixteenth century, he made several paintings of some relevant cities in Spain, commited by King Phillip II, who wanted an exact and complete description of the geography of Spain. 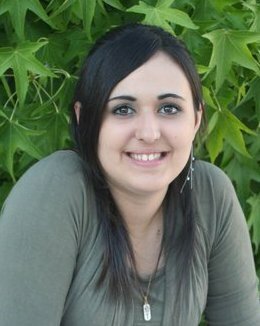 Málaga is the city that we are going to study. It is situated in the south of Spain and particularly located between the sea and the mountains. These two factors influenced a lot in its development. The image represents a panoramic perspective from the sea focusing on the fleet of García de Toledo and the city in the background. It is possible to distinguish the landscape from the Castle of Gifralfaro to the proximal village of Torremolinos. In those times, Málaga had a population of around 15.000 inhabitants and was a very important commercial city. Gifralfaro Castle is placed at the top of a hill in the right margin. It was built by Caliph Abderramán III and in 1340 the Nasrid king Yusuf I remodelled and transformed it in a luxurious castle. After that, the Catholic Monarchs used it to take it as their vacation residence. The origin of this construction is primarily a refuge for the troops and also to protect the Alcazaba as it had a better view of the city and the sea. Further down we can see the Alcazaba or fortress. This area is connected to the rest of the city by two roads, one along the hill which has a battlement and another road going to the sea. The fortress was formerly a Phoenician building but then reconstructed with limestone by the bereber king of Granada, Badis ben Habús. After that work, its function was aimed to be rather defensive and it was the residence of Governor and knights. Apart from that, Málaga had with a big city wall to protect itself from any danger. This wall had a Phoenician origin although it was rebuilt several times. It went across the coast from the Gibralfaro castle to the other side of the city. Moreover, the city wall had a number of sea gates with the aim of getting the materials from the commercial ships easily. Not only the battlement, but also watchtowers which were made in sixteenth century, can be seen in the picture. Their purpose was the defence of the territory against the attacks of Moorish pirates. Other important elements and characteristic parts of the city are displayed such as the or fortress. Apart from that, the author of the painting wanted to show us the urban skyline, formed by the city wall and many religious buildings such as churches, convents and the cathedral. Among the religious buildings that we can appreciate in the picture we can mention the Mártires Church, made in Moorish-Gothic style. It is located on the city centre and it was originally built by Catholic Monarchs. In addition, we can see the church of San Juan situated on the left, whose style is the same as the previous one, as it was built in the same era with pointed arches on pillars and a tower that was finally completed in the year 1543. To finish with, in the painting by Anton Van den Wyngaerde, we can see an Arab spring, but it was not until 1586 that a better and modern one was built. 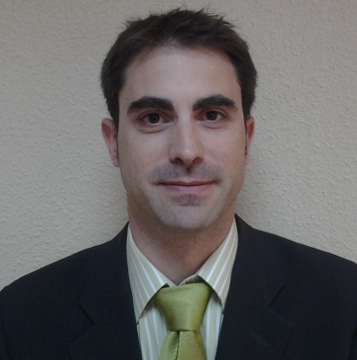 This caused a mayor delay in the commercial development of Málaga, because before that it was so difficult to embark on that área. Wyngaerde also portrayed the urban structure by showing the different parts of the city, from the center to the outskirts. 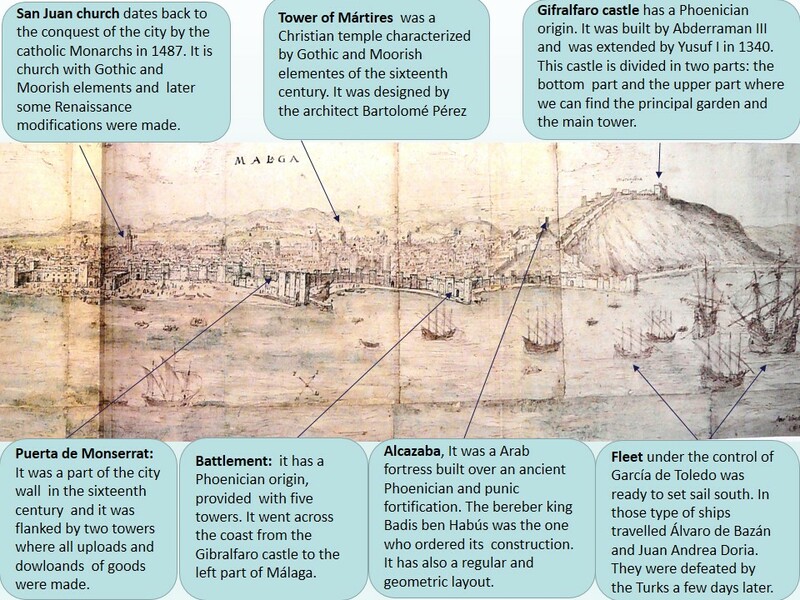 This is why the painting was made in 1564 and is considered a very important graphical document for knowing the historical, economic and social evolution of Málaga. This painting represents the city of Zaragoza in the late 20th century in Spain, by Joan Soler, a modern painter from Mallorca. The image belongs to a private collection. This type of image is called “Zenith” and it means that the place from where we can see the city in the picture is taken from the top to the bottom, thus, the perspective seems that the subject is situated perpendicular to the ground. Zaragoza is a very big and important city in the north of Spain. It is the capital of Aragon region and is very well-known because of the Basilica of Pilar and other significant monuments. The image portrays a lot of differences between the old quarter and the new part of the city. The left part of the city, to the other side of the river Ebro, started to be constructed in the last decades of the 20th century and became a new neighborhood with a large quantity of people living there. Zaragoza is a place influenced by many cultures so you can notice some differences within the city. It has the characteristics of a Roman city, so the two most important elements were the cardus and decumanus avenues, two streets that crossed the city from the North to the South and from the West to the East. However, in the medieval age a big city wall was built and the urban layout changed a little bit, becoming more irregular. As we can see in the picture the two elements that they used to connect the city centre with the suburbs were two bridges. Those bridges were too important because they were the main way to join the different parts of the city to the outskirst and the cropfields. In the first place we can see the “Stone Bridge” that today keeps its original name; in the second place we can see the “Tables Bridge” that now is called “Puente del Pilar”. The street that can be seen in the center of the image is the Echegaray y Caballero Street. In this place you can see the back part of the basilica, which is the most important part for the painter. However, the square that appears in the foreground alongside with the river, looks like the main element for him and also for a great number of citizens. These elements are those that appear more detailed, so it makes us think that the painter wants to stand them out. It is curious because the place where the Basillica of Pilar is settled was the same where it is supposed that the Virgin Mary appeared. At first they had told to build a small chapel but in the Baroque era they constructed this major temple. It is also said that our lady of the Pillar save Zaragoza in the second world war when the enemies army throw away three bombs, that nowadays are on the wall of the cathedral, because they were found at the floor without exploding. In the end of the 19th century it had become clear for the different town halls of Zaragoza that were necessary a few deep changes in the city to give content to the immigrants of the rural exodus and to adapt the city to the new economic and social realities, this new area was called Ensanche. As in other Spanish cities, the town hall planned the tracing of a “New Zaragoza “, out of the historical center with new buildings and wide and regular streets. It was expected that the citizens from Zaragoza would go progressively leaving the old Zaragoza and they would be established in the newest and best housings. The problem of the Ensanche is that they did not take into account the social reality of that Spain, most of the population was very poor and was not having incomes to be able to buy or rent the new housings. That is why these people went to live to buildings of worse conditions and in slums removed from the center and with scanty services, whereas the Ensanche was a place where the social groups with a higher level of incomes fixed their residences. The workers were mainly dedicated to the secondary and tertiary sector. In the 20th century, they develop industries as the metallurgy, food industry, electrical production and chemical industry. Besides this, there were important sugar factories and as modern services, the railway industry. Zaragoza was placed in a strategic location, which makes the railway to have much more relevance from the 19th century on. Sunset over Riga is a painting on canvas representing the sunset over the ancient and medieval city of Riga, capital of Latvia, in 2004. Riga is the largest city of the Baltic States and its historical centre is a UNESCO World Heritage Site, remarked for its Art Nouveau architecture and the 19th century wooden architecture. The painter of this work of art is Thomas Kinkade (1958-2012), an American painter of popular realistic, bucolic, and idyllic subjects and he characterized himself as “Thomas Kinkade, Painter of Light”. In addition, it is a painting of “Plein Air” style, what means that the painter reproduces the actual visual conditions that he sees at the time of the painting. Besides, this work of art cannot be visited in any museum, but it belongs to the Thomas Kinkade Company collection and it is available for being purchased through his official website. In the image we can appreciate part of the urban layout of the city, and therefore we can see an irregular urban pattern due to the amount of narrow streets interlaced between themselves and the agglomerated buildings that form a maze network of alleys. Probably, some centuries before it has a cathedral morphology that reminds us how medieval cities were during the Middle Ages. In addition, the medieval walls were demolished in the mid nineteenth century and later, were replaced by a high amount of boulevards and public gardens that surround most of the old city, as we can observe at the bottom of the image. Besides, the city of Riga lies on the banks of the Daugava River. In the background we can observe some important landmarks of the city extending to the horizon during the sunset. Besides, Riga’s key economic activities were fishing, animal husbandry, and trading, and later developing crafts in bone, wood, amber, and iron. Nowadays, Riga is one of main economic and financial centers of the Baltic States and the biggest exporter of wood products, pharmaceuticals and metallurgy. Besides, Riga’s Port is one of the biggest in the Baltic States, and lots of commercial ships leave from the Daugava River, an arm of the Baltic Sea, as we can see at the bottom of the image. 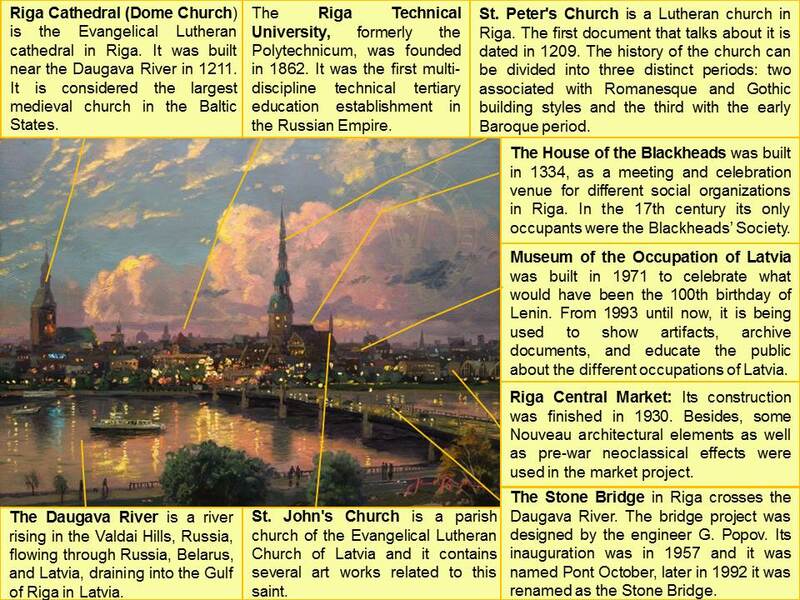 In addition, tourism is also a large industry in Riga, due to the numerous landmarks that can be seen in the background of the painting and because the Riga historical center was recognized as a UNESCO World Heritage Site in 1997. Regarding the more relevant buildings, firstly on the left side of the painting we found the Riga Cathedral, which is an Evangelical Lutheran cathedral and the seat of the Archbishop of Riga. Besides, it was built in 1211 and is considered the largest medieval church in the Baltic States. Furthermore, it was subjected to several additions and renovations in the late Middle Ages and the modern era, as a result there is a mix of Romanesque, Gothic, Baroque and Neoclassical elements that can be seen nowadays in the Riga historical center. In addition, the Museum of the History of Riga and Navigation which is housed by the Riga Dome Cathedral, is the oldest public museum in Latvia and the Baltic, dated in the 18th century and is one of the oldest in Europe. Nowadays, it has the largest collection of material evidence of the history of Riga. Next to them, we can appreciate the Riga Technical University dated in 1862 which was the first multi-discipline technical tertiary education establishment in the Russian Empire. On the one hand, in front of this last landmark it is placed the Museum of the Occupation of Latvia, which was built in 1971 to celebrate what would have been the 100th birthday of Lenin. It worked as the Museum of Red Latvian Riflemen until 1991. Later, in 1993 it was used to show artifacts, archive documents, and educate the public about the occupations in Latvia by the USSR in 1940, then by Nazi Germany in 1941, and then again by the USSR in 1944. On the other hand, on the right side of the image, we can find the Riga Central Market whose construction was finished in 1930 and in which some Nouveau architectural elements as well as pre-war neoclassical effects were used in the market project. In addition, Art Deco elements are used in some facades. Finally, in the foreground we can appreciate the Stone Bridge that crosses the Daugava River. In one of the banks of the river we can perceive the Old Riga and in the other one an opened space formed by boulevards and parks along which the people walk. In this way, the bridge project was designed by the engineer G. Popov. Its inauguration was in 1957 and it was named Pont October, but later in 1992 it was renamed as the Stone Bridge. In addition, the Daugava River is a river rising in the Valdai Hills located in Russia, flowing through Russia, Belarus, and Latvia, draining into the Gulf of Riga in Latvia. The total length of the river is 1,020 km and forms part of the international border between Latvia and Belarus. To conclude, as I have said before, I want to emphasize that the historical center of the city was declared a UNESCO World Heritage Site in 1997, thanks to its Art nouveau buildings and to the fusion of architectural styles, where there coexist towers of churches of the Middle Ages, monuments and wooden architecture of the 19th century and a marked structural Soviet rationalism. Besides, Riga was the European Capital of Culture during 2014, along with Umeå in Sweden and organized more than 200 cultural events. As a remarkable fact, we can highlight that some important monuments turned into rubble during the II World War and that the city of Riga suffered a fire in 1209 which severely damage some relevant landmarks. Interestingly, finally, we can point out that tourists called Riga as “Paris of the East” due to the amount of tourist attractions and cafes on the sidewalks. This picture represents the tram of Porto. It is made with pencil on wood in 2010 by Udane Juaristi (Azkoitia, 1985). 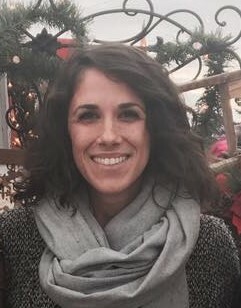 She is a painter who is licensed in Fine Arts specializing in painting and studies in l´École Nationale de Beaux Arts of Paris. This picture is part of a collection entitled “cars and trams” and has been exposed in many cities of Spain, above all in the Basque Country. The picture is not dated, but we can know that is a modern painting according to the style of the cars and the clothing of the people. We can see as the principal element the tram, specifically the number 22, what has allowed us to know the area of the city. The picture was taken near St Catarina Street, that is the main shopping area of the city; this is pedestrian street and is located at the top of the city. As a curiosity in the picture we can see some seagulls because in Porto there is a big colony of urban seagulls. Porto is one of the most important cities in Portugal, although it is not a very big city (237.559 habitants). It was founded in 1123 and it is situated in the North of Portugal, on the right bank of the Duero river. Actually, Porto has centralized its urban structure around the Duero river. Apart from this center the city has many slopes, caused by the difference in height between the Duero river and the highest points of the city which is around 75 meters. As many other European cities, Porto is an old town with a wide historical heritage, but in recent decades has undergone an extensive modernization. It has the longest subway netweork in Portugal to cover the whole metropolitan area, from the city center to outskirst. Also, the Sá Carneiro International Airport has recently been expanded to a capacity of 16 million passengers a year. 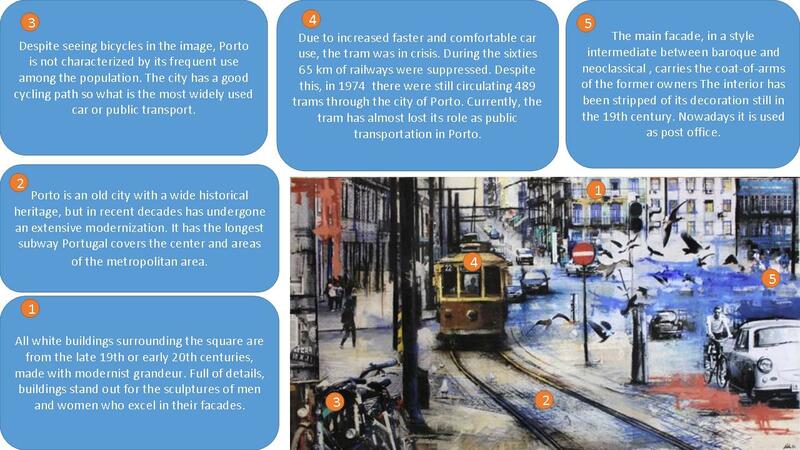 In Porto, old trams have been restored and only three lines are working nowadays. The line 22 circulates between the Carso area and the area of Batalha, where the Batalha Square and São João theatre are, and it also passes along the Avenue of the Allies and very near of Santa Catarina street. In the 19th century Porto had an economic and political decline in the city with only some service activities, such as shipping and maritime trade. But in the decade of 1890 and the beginning of the 20th century the port of Leixoes boosted an economic growth in Porto coinciding with industrialization and the arrival of the Republic. A symbol of this era is the construction of the Avenue of the Allies. The urban space of Porto started to be developed in the late 19th century. A new Central Business District was created and an intense process of functions specialization was set on each urban area. The constructions made in the early 20th century broke with the traditional ambience of the city and consolidated modernity. The railway station of São Bento was an example of new communications in Porto, that converge several roads and railway lines, which also contributed to turn the city into the main shopping center in the Northern region of Portugal. Despite the progressive outsourcing center, industrial activity continues to be of great importance to the work in its industrial belt full of factories for textiles, footwear, furniture, ceramics, metalwork, jewelry and other manufacturing activities, some also craft. In 1919, as a response of the Lisbon attempt of independence, conducted by Paiva Couceiros, Porto became tentatively capital of Northern Portugal. The immediate Republican reaction ended the uprising. The Salazar dictatorship, which lasted until the Carnation Revolution of 1974, much improved infrastructure, highlighting the construction Porto Arrábida Bridge in 1963. In 2001 Porto was, next to Rotterdam, cultural capital of Europe and, for such an event, the striking auditorium “Casa da Música” was built in Boavista, symbol of the capital. Today Porto, economically speaking, is lagging behind Lisbon, while still maintaining its reputation for working, open and welcoming city. 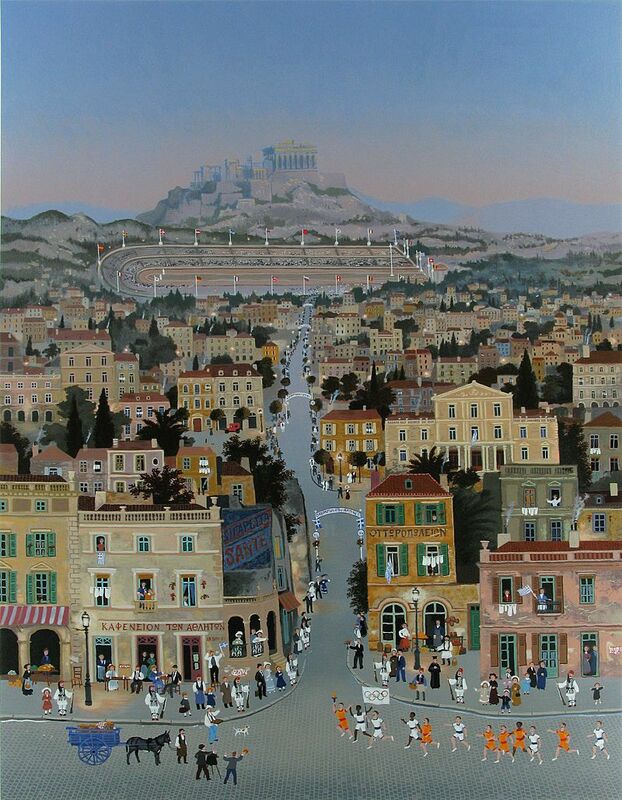 This work of art represents the arrival of the US Olympic team for the 1896 Summer Olympics celebrated in Athens and it was painted by Michel Delacroix in 1994. The author was commissioned to create a series of paintings that commemorate the 100th Anniversary of the Modern Games by the Atlanta’96 Olympic committee. “Athens 1896 Olympics” can be visited at the Olympic Museum in Lausanne, Switzerland. This picture is an example of landscape painting that characterizes the Naïf style of Delacroix and his particular vision of urban life. The city of Athens is the capital of Greece, a country placed in Europe’s southeast. It is placed in the south of Attica region and borders in the southern part of the Saronic Gulf. The rest of the city is limited by the Mounts Aegaleo, Parnitha, Penteli and Hymettus; placed respectively in the west, northwest, northeast and east. The foundation of the city dates back to 7000 B.C. and it had its major expansion during the 20th Century. Nowadays, the tourism in its six archipelagos and the archaeological deposits constitutes the economic engine of the country. In the picture we can observe a great variety of arboreal species as cypresses and palm trees, which correspond to the Mediterranean dry climate of the Hellenic country. 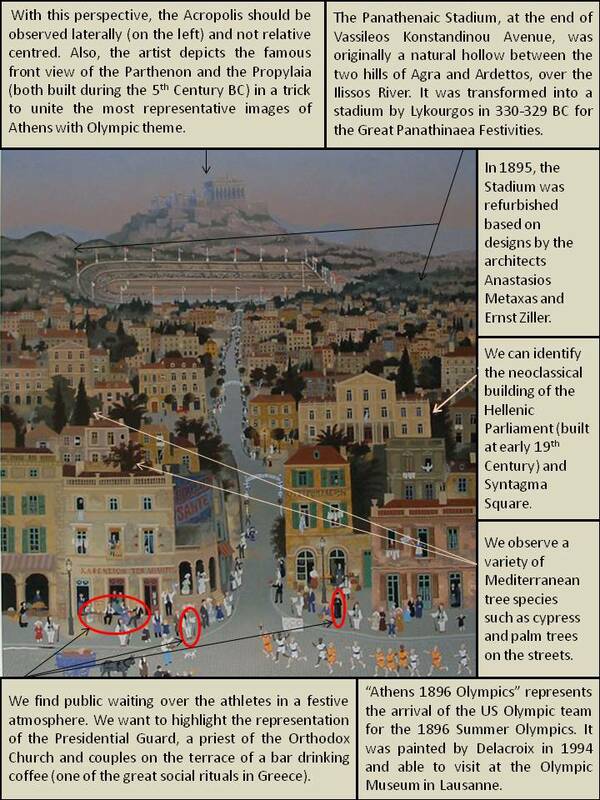 The image focuses on the Panathenaic Stadium aid of a large central Avenue (inspired by Vassileos Konstandinou Avenue) that leads the eye to it. It was originally a natural hollow part of the ground between the two hills of Agra and Ardettos, over the Ilissos River, in the current Pangrati neighbourhood. It was transformed into a stadium by Lykourgos in 330-329 BC for the athletic competitions of the Great Panathinaea Festivities. In 1895, the Stadium was refurbished based on designs by the architects Anastasios Metaxas and Ernst Ziller. The focus in the Stadium is reinforced by the uniformity of colours and structures in urban construction. This is one of the licenses that the author is taken in its representation of Athens 1896. It is common in all the work of Delacroix that his cities present an orthogonal planning regardless of the reality of the city or the time. The real planning of Athens is very irregular and chaotic in this old city area. This irregularity is interrupted only by the large quadrangular Syntagma Square where the Parliament is located. In the picture, though an unreal placement, we can identify the neoclassical building of the Hellenic Parliament (built between 1836 and 1843) and Syntagma Square in the right margin. The Olympic Stadium with its characteristic forked form and crowned by the flags of the participating countries listed in an environment that is not fully correspond to reality. With this perspective of the Stadium, the Acropolis should be observed laterally (on the left) and not relative centred. Also, the artist depicts the famous front view of the Parthenon and the Propylaia (both built during the 5th Century BC) in one more trick to unite the most representative images of Athens with Olympic theme. Likewise, we find public waiting over the American athletes in a festive atmosphere. We want to highlight the representation of three people at the bottom of the painting that define some of the most important Greek social characteristics: the Presidential Guard and their characteristic uniforms, a priest of the Orthodox Church and couples on the terrace of a bar drinking coffee (one of the great rituals in Greece). This restaurant is surrounded by other commercial buildings. We can also see people participating at the windows from their private homes (appears hanging clothes). To conclude, we want to emphasize the relevancy of the city of Athens and the Hellenic culture for two factors: for being the cradle of the democracy and the origin of the Olympic Games. 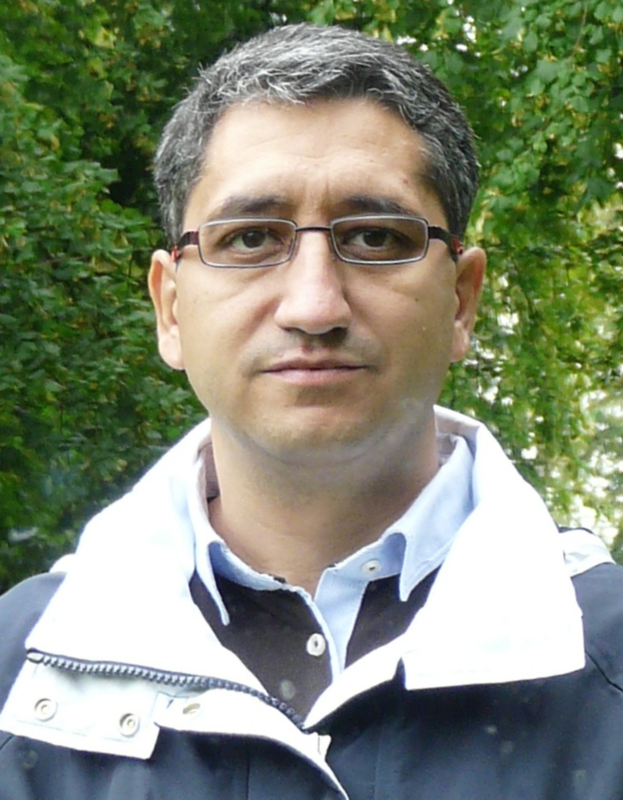 The Greek civilization is at the origin of the Europe through that we live at present and the Olympics have turned into the major one and more out-standing sports event worldwide. Our country could enjoy the honour of organizing the Games in the year 1992, in Barcelona. This work of art is a mosaic of the city of Malaga, in Spain, from the 18th Century. Its author is unknown. It is made with painted ceramics, specifically 132 square pieces, and it is located in the wall of a tavern called “Chiringuito Escribano”, that we can find in the “Antonio Banderas Promenade”, located in this city. The author was inspired on the views from the top of an old quarter of Malaga called “La Coracha” to create this mosaic. Its most representative figure is the Cathedral of Malaga and in the background of the image we can see the urban structure of the city and the mountain that fortified it. This image shows with a lot of details the type of houses and historical buildings along Malaga seaside and how they are laid in the ground. According to the urban structure, at the top and in the bottom right we can distinguish a number of crop fields; in the center, the old quarter of Malaga, on the left, the seaport and in the top left the suburbs. We can appreciate that the streets have not got an unique direction although the majority of them lead to the beach, so they are forming an irregular urban layout. This happens because the city was built along the coast, due to its complicated topography, as it is located into a valley between the mountains and the sea. In the center of the image, there is a street that goes up from the main entrance of the port to the city center, called “Molina Lario”. Malaga is not only a city that based its economic activity on fishing. Also, one of its most important activities on that time was agriculture. It is caused because the city is located in the center of a bay surrounded by mountains. Its proximity to the sea promotes that the ground is more fertile. For this reason, in the background of the image we can appreciate some cultivated fields near to some houses that probably are farms. The most characteristic crops are oranges and lemons. Obviously, the main attraction of the mosaic is the Cathedral of Malaga, that stands up practically in the city center. It is Renaissance, although it has some Gothic and Baroque details, and its real name is “Santa Iglesia Catedral Basílica de la Encarnación”. It is curious to note that the Cathedral of Malaga, once dedicated in 1588, was not completely finished until 200 years after. Around the Cathedral there are some houses belonging to the richest people of the city, because the buildings have more than one floor and there are located in the city center, in contrast with the houses that we can see in the outskirts, that are made with poor materials and only have the ground floor. To finish with the architecture, we can find near to the sea some buildings that are made specifically for fishing and shipping. Concerning its economic activity, we can stand out as a curious fact that the fishing activity was not only conducted in the Mediterranean Sea, but also along the Guadalhorce River, that go across the city. Nowadays, due to pollution and the irregularity of its stream, fishing is impossible in the river. The species that the fishermen could find on the sea was anchovies, lobsters, shrimps, mackerels, soles, hakes, octopus and overall sardines.